I was introduced to the idea of a family economy last year by my friend, Ralphie, of Simply on Purpose. After hearing her talk about it a few times, and the benefits of it, I decided it was something I really wanted for our family. We’ve now been doing it for about six months and have adapted it to fit our lifestyle and family needs. I’ve been getting tons of questions about it, so I’m sharing all the answers today! WHAT IS A FAMILY ECONOMY? It’s basically a work and pay system where the kids earn money within your home and learn how to save and be accountable. I want my kids to grow up with a real understanding of money — how much things cost, how we have to work for things we want and need, how to set goals and save for bigger purchases, the difference between a savings and checking account, the difference between a debit card and credit card, how to invest their money, how to pay a bill, how to build their credit, and so much more. Obviously we’re starting very small and very basic, but the plan is to have them leave the house at 18 years old with a very clear understanding of money on all levels, and to be financially independent. WHAT DO YOUR KIDS GET PAID FOR? Many of the items they’re paid for are their day to day things they already do. It’s helpful because adding extra things to their day can be a big commitment for both of you (them to find the time, and you to nag them to get it done). You can see their itemized daily chart here. They attend a school with a no homework policy, so that’s why their after school assignments are all educational. You could build in homework to this instead. They do not get paid for Saturday chores. HOW DO YOU KEEP TRACK OF THEIR DAILY WORK? They each have a chart with their daily work printed on it. They are responsible for checking off each item after it’s completed each day. Once it’s checked off, they need a parent to sign it off for them. They don’t get paid for it if it’s not checked off and signed. We keep these sheets in the kitchen where they’re easy to see and sign off throughout the day. Just a tip: I print off a bunch of these sheets and keep them in the cupboard so it’s easy to put up new ones each week. We do payday every two weeks, and they get paid their age. So $5 for Fos every two weeks, and $7 for B every two weeks. Each year their earnings will increase $1 with their age. At some point we might also go to payday every week, but not now. WHAT HAPPENS WHEN THEY WANT TO BUY SOMETHING? If they see something in a store or online that they have to have, they tell me and I pay for it with my credit card and then withdraw that amount from their digital checking account. They are not allowed to withdraw from their savings account. HOW DO YOU KEEP TRACK OF THE MONEY? We use Google Sheets. I have the app on my phone, and Google Drive is accessible from any computer, which makes it so easy. Each of them has their own sheet and they are divided up into Savings, Checking, and Donations. We donate 10% of our income to our church, and then divide the remaining money into their savings and checking; 60% into Checking, 40% into Savings. They also always have the option to put more in their savings account. I’ve linked to a blank spreadsheet you can use for your family — just click FILE > MAKE A COPY and then save to your Google Drive so you can fill it in for your family. WILL YOU EVER USE REAL MONEY? Yes, absolutely. We’ll “transfer” their virtual money to a real bank account when we’re ready to give them a debit card so they can learn about different accounts and how banks pay out interest. We haven’t decided the specific ages, but at some point after that they will get a credit card, so they can learn how each of those works and learn how to pay a bill. Learning about investing will also come sometime in high school as well. But that’s all still pretty far away, so for now we’re doing only virtual money in their accounts, which makes it so easy to transfer and pay them. If they receive money for a birthday or Christmas, they “deposit” the money into their spreadsheet and then I keep the actual bills. WHAT ARE THEY FINANCIALLY RESPONSIBLE FOR NOW THAT THEY’RE EARNING MONEY? Right now, while they’re still young, they are only responsible for purchasing their “wants.” But at some point in the future they will be responsible for paying for their own clothing, gas, insurance, etc, in addition to their wants. We haven’t decided the specifics quite yet, but I think the more responsibility you give them, the better. And before you think it’s crazy to make them pay for everything on their own, remember…it’s actually your money. You’re just re-routing it through them and teaching them to be responsible with it. And trust me, when they learn how much things cost, they instantly become so much more frugal that you as a parent can be. HOW MUCH WORK IS INVOLVED FOR ME AS A PARENT? Your work load will definitely depend on which jobs you decide on as part of your family economy. I spend maybe thirty minutes a day helping them with their afternoon educational things, and then we do pay day every other week on Sunday afternoons after we get home from church. Payday takes about ten minutes total. Every child is different, so I’d say there’s no specific age and you should just gauge as a parent. I think B would have been ready at age three, but Fos is definitely just barely ready at age five. WHAT IF MY HUSBAND IS SUPER UNINTERESTED IN PARTICIPATING IN THIS? So was mine! And that’s ok – don’t pressure him to be involved. My husband wasn’t against it at all, he just wasn’t interested in being responsible for it. But after about a month, he started to see the benefits and he gets involved here and there and is very supportive since he sees the changes it’s making in the boys. We’ve talked about how he will be much more involved as the boys get older and we open real bank accounts for them, give them credit and debit cards, and start investing. But for now, when it’s basically pretend money, I’m handling pretty much everything and since I knew this going in, I’m totally fine with it. It doesn’t need two parents to keep it running. DO YOU FEEL LIKE YOU’RE CONSTANTLY NAGGING YOUR KIDS? At first it was definitely a transition, and I felt like I was constantly reminding them. But it gets better! I also took a cue from Simply On Purpose who, instead of nagging, just calls to her children, “Does anyone need me to sign off on their chart?” It’s a great way to remind them without having to nag, and it works every time for me! It always gets a positive, happy response instead of the frustrated response I get from nagging. WHAT IF THEY FORGET TO MARK SOMETHING OFF? They’re still pretty little, so I am often lenient about this — especially with Fos since he’s only five. We’ve had a few weeks where he’s missed something, so I usually just make him recite a few memorized scriptures to earn back the point. WHAT IF THEY DON’T WANT TO DO IT? HOW DO YOU GET STARTED SETTING UP THE FAMILY ECONOMY? As soon as I learned about it, I started thinking through it and decided to just go for it. I created their spreadsheets and daily check off sheets, and then sat them down over the weekend and told them we were starting this the following Monday. I explained that this was a way they’d be able to save for their college and LDS missions, and also earn money so they could buy whatever they want. I tried to have everything in place and ready to go before introducing it, so it was easy to launch as soon as we discussed. HOW DO YOU FEEL ABOUT IT AFTER SIX MONTHS? I love it more than when we started! The biggest change I’ve seen is their perception of money. Like I said above, they are much more frugal than I am now that they understand how much things cost. Like that a medium sized LEGO set would wipe out their six months of earnings in their checking account in one fell swoop. I also love that when we’re out and they beg for a bag of m&m’s or an ICEE, I can say, “Yes of course you can have it! But you’re responsible for paying for it.” And suddenly that neeeeeeed becomes not quite so important. It definitely is a change as a parent, and requires a little more of your time and effort, but personally I think it’s worth every single bit of effort. This one system impacts so many areas of their life in a positive way and is teaching them invaluable skills that will benefit them for the rest of their lives. If I left anything off, or if you have additional questions, leave them in the comments! I got my pocket money in coins for a long time, so I could see the money diminish when I paid for my sweets and it must have worked, because when I was 16 my parents gave me all the money for a semester and I had to manage it on my own and I am debt free to this day. But these are different times, and my kid already knows more about the cash machine than about coins. Also, I would be really interested in those activities you listed in your spreadsheet. How does “coding” work at that age, for example? Great questions! First, I shared all the educational programs that we use in this blog post: https://www.merricksart.com/2017/10/my-favorite-educational-activities-and-programs-for-kids.html. So you’ll see the coding and typing websites that we use and love. Second, we have some things in our home that are family expectations that they do because they’re part of the family. Like put away their dishes, and set the table, clean their room, and do Saturday chores. They don’t get paid for those things, and they having that distinction is helpful to instill personal motivation that’s separate from their reward based motivation. Ralphie, from whom I learned this system, has talked about this too and makes a great point. Our entire society and lifestyle is built off of a work/reward system. Everything that adults do is motivated by some kind of reward. 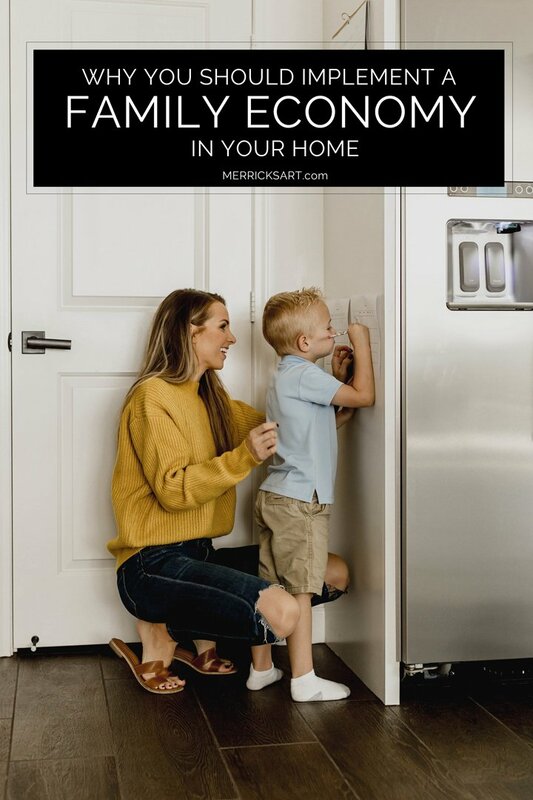 So I think as long as you differentiate different roles and jobs within the home, and help them learn that not ALL work brings monetary rewards, they’ll be ok. I hope that helps! We started the family econmy this year and it’s been awesome so far! It’s such an incredible system!! I am so wanting to start this but am still wrapping my head around how it all works and how to make it work best for our family. how do you keep their money separate from yours? now it may not be a lot of money but as they get older and are earning more and maybe spending less? do you have a separate account that you transfer their earnings into every 2 weeks? I follow ralphie too and am just stumped on how to start. my oldest just turned 5 last week and i know she’s ready for this! plus, i love how it gives them the ability to make their own choices rather than me always saying no. I wonder the same thIng about the money…we gave it a go in the fall and because we had just opened savings accounts for Our two older kids in the summer, i found it was easier to transfer their money To their accounts each week. The bit i’m still working out is keeping track Of How much of the total is savings/spendIng/giving as more keEps going in. I think i just need to keep track Elsewhere and have running totals that get updateD every time money is deposited or withdrawn. I think the spreadsheet I shared will help with this! You can still do deposits every week if you’d like, but keep track of it all on the spreadsheet as well. Also I’m curious how you handle their checking/spending money? Do you do physical bills? Or a ledger? So interesting to learn how people adapt it to fit their lifestyles. Thanks for commenting! This is a great question, and I’m getting the same question on Instagram today so we’ve been discussing. It’s something I hadn’t considered until now, but it’s a great point. I think we’ll open their real bank accounts soon and do lump sum transfers every few months, or once a year. They’re only earning $14 and $10 a month, so doing a transfer every month is not really worth it in my mind. We’ll still keep their virtual accounts, because those are easy to transfer in and out of day to day, but then those accounts don’t rack up so high. Hope that helps! Do you find that they are more grateful for any presents or treats that you buy for them out of your money rather than their accounts? Totally! Especially now that they know how much things really cost. And I ALWAYS tell them how much things cost so they are aware of what I’m spending. I follow Ralphie too and We implemented this about three months aGo, I’m Really loving it! One of the things im running into is i have One child who Always wants to buy candy… do you aLways let them buy whatever and whenever Or do you say no? I usually try and redirect my sons attention elsewhere But im not sure if Itll woRk the way i want if im always saying no when its his money… i dont want to defeat the purpose! Thanks! That’s a great question. My five year old is always interested in buying candy too, and I’ve let him several times. But then we have so much candy in the house and I hate it because it makes them crazy. So we’ve implemented a “treats on Sunday” rule where I make something special and yummy after family Sunday dinner each week. It’s been helpful to have a different rule about treats to help guide his spending. So instead of saying no, I’d say, “remember our Sunday family treat? If you have candy now, we won’t be able to have a treat on Sunday. If you choose not to buy this candy, you can have a Sunday treat AND save your money!” That hasn’t worked for us EVERY time, and he still insists on buying the candy, but then if I hold fast to the no treat on Sunday, he learns that his frivolous spending was a direct correlation and affected the whole family, and that’s helped him learn a lesson. Of course, every kid is different, but maybe that will help? Good luck! Merrick, this is such a great idea. My boys are teenagers now and we have our own system of chores, paying for things, etc. But this is nice to start with younger kids. But i am most fascinated by the fact that your kids go to a no homework policy school. I know they are young. My boys spend so much time doing homework, studying for tests, etc. They would have loved this–LOL! But I am curious what the parents think of this. and what the school’s rationale is. Will this policy be implemented all through the school years or just elementary school? I have never heard of this before and am really interested. I hadn’t heard of it either until we moved to this area and started attending the school. It’s a STEAM magnet school, so they do a lot of project based learning, and instead of homework they encourage children to read 30 minutes per day. As they go to middle school, homework is implemented, but I think in elementary school it’s really nice to not have it because it becomes such a burden and most of it is busy work that becomes more work for the parents than for the kids (which is definitely what we experienced at our previous school). This is a great idea! Thanks for so much details! We are 2 weeks in to our family Economy and it is great! We use a cash system because I thought it was important to get them familiar with that before we start checking/savings accounts with a bank. The first purchase my 5 year old made was for a box of cars 3 Mac&cheese, and he proclaimed it the best Mac&cheese ever! I used the chore chart you posted a while ago as a template, so thank you for sharing all this with us. Thank you for sharing all thIs info! I have been looking into starting this with my Boys. If they earn their age each week, How much money is desucted for those days when they choose not to do the work? We also charge our kids money for screen time. They are able to earn screen time and it helps them limit their time. Pinning! Oh, that’s an interesting idea to charge them for screen time – very clever! I Started to do this and then dropped the ball but this motiVates me to start again. What are their saturday chores and can you tell me about their zoNes? And if they decide they don’t want to dO thEir work one day, do you not Pay them for the Entire week? Or dO you deduct that day’s worth of pay…? This is such a great sysTem, we love it AROUND here! Another thing it ADDRESSes is entitlement and helps to get rid of that mentality. “The Entitlement trap” by Richard and Linda Eyre helps with the why and some of the ins and outs. It really helped me wrap my head around it all. Your post explains it really well and it’s fun to see how it works for your family. I love this! I teach 5th grade aNd we do a lot of personal finance in my clsss, but thats not the norm. Every yesr my students make a budget and i tie it into math standards. If you google “scholaStic t.rowe price” you cAn find a ton of free worksheets and financial literacy uNits they Partnered to make. Their new high school ones even cover investing. My kids are 18 months, so i have a while, but im excited to teach them these skills! IM NOT SURE WHY MY REPLY DID ALL THOSE WEIRD CAPITAL LETTERS AND DELETED MY APOSTROPHES. SO WEIRD! I love that you have them break it up into spend/save/give. My parents did that with me when i got my first (very part time) job in middle school, but starting earlier is even better! I have to say, I’m feeling a little uncertain about this. It seems hard to choose what tasks are part of this list, and what tasks should be “default behavior”. When I was a kid, I tried to propose a similar list to my parents – “hey mom, PAY ME FOR BRUSHING MY TEETH!” BUT MY MOM SHOT IT DOWN IMMEDIATELY. I GUESS IT MIGHT BE A CULTURAL THING, BUT IT WOULDN’T FLY IN THE HOUSEHOLD I GREW UP IN. THANKS FOR A THOUGHT-PROVOKING POST, THOUGH! Sorry for the weird caps. Not sure what is going on. Yes, you definitely have to do what works best for your family, and every family looks different! I’ve been doing a family economy in my house for the past year and i initially had the same concerns. i don’t want to pay them for things i just expect them to do. my husband had a great idea: instead of saying, we’re paying you for these things, we say, “these are the responsibilities you need to do to qualify for financial lessons (i.e. get money and learn how to use/save/spend it). it feels better to us! I had the exact same questions as Dana! What are their saturday chores and what chores do they not get paid for? Also, what all do they have to do for their zones and what classifies as a zone? i have two girls ages 5 and 3 and would love some good Ideas of age appropriate house chores! Also, what happens when they decide they dont want to do their paid chores or un paid chores? I also follow Ralphi but would love Some good ideas on motivating My little people! Thanks! Ha…seems Like A FEW OF US HAVE THE SAME question, what do you do when they miss a chore or Choose not to do it!? I’ve seen the family economy idea a little bit and find it interesting. In our house we pay half their age every week as allowance, but with no ties to chores. They do the work I ask them to do because I ask them to do it, the end. Each of our kids has a notebook where I write down how much they earned, and how much is moved to their “mission fund” and how much is moved to tithing, keeping a running total of what they have in savings. In the back of the notebook I track how much has been added to the mission fund. I add the two totals together at the end of every month and transfer the appropriate amount from my bank account to the kid’s savings account and then pay their tithing for them. It has allowed my kids to save several hundred dollars each over the last couple of years, but the biggest thing is we have a rule about not giving in to impulse purchases. Their dad and I stop and think before buying things, so we make them do the same. For every $10 it costs they have to wait 24 hours before they can pull the trigger, to prevent them from getting in the habit of spending $$$ on candy, useless trinkets, and other things that are of little value. starting this next week. if they miss one day do they not get paid for that week? trying to figure out the details. What do you do if they dont do their Checks? They dint get all of their money or just a portion? We did something similar when our kids were little, but our chore system was not tied into the allowance. Chores we’re a requirement of being a member of the family. Allowance was simply their money management SKILL building. We would calculate their money needs at the beginning of each school year, to include scouting dues, soccer shoes, lunch money to buy at school twice a week, etc. We built in their fun money, and their savings, and divided the large Total into a monthly pay day. So each month they would receive their allowance, and we’d go to the bank to deposit 20% in savings. The rest went into checking and cash. Then when they wanted or needed something, they paid for it themselves. Our daughter was frugal. She always took lunch rather than buying. She saved more than 20%. When she turned 16, she bought her own car. Our son spent more of HIS money on gadgets and toys, and had to use the family car. Although he did save enough for his insurance. Both kids are good money managers AND savers, today. It was an excellent education.